1) What is Clicker Training? I use a method of positive reinforcement training called “Clicker Training”. Clicker training is a scientifically based training method that has been proven to be very effective. It works by using a marker signal or noise, the “click”, that the dog learns means they have earned a reward. The clicker device is pressed, making a “click”, when the dog does something you like and understands that behavior is wanted. After the click is heard a reward is delivered to the dog. 2) Do I have to use a clicker to train my dog with Trust Your Dog Training? No. You may also choose to use a word instead of a clicker. However, a study completed by Lindsay Wood, ACAAB, showed that dogs trained with a clicker learned significantly faster than dogs trained with a word. 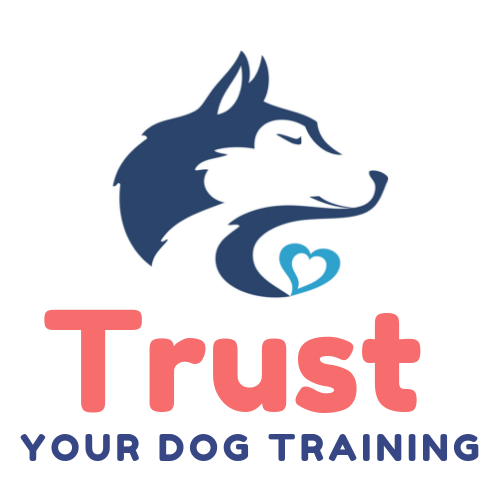 3) May I use a choke chain, prong collar or shock collar to train my dog with Trust Your Dog Training? I don’t recommend the use of these training tools because these training devices work because they cause the dog discomfort to suppress unwanted behavior. However, if you are currently using one of these tools and feel dependant on it for your safety I will work with you to help you make positive behavior changes so you don’t need it long term. For more information about the use of these devices please Click Here to read the American Veterinary Society of Animal Behavior’s Position Statement. 4) But I just want my dog to stop insert inappropriate behavior here! Why shouldn’t I use a choke chain, prong collar, shock collar or another form of punishment? Punishment can be very good at suppressing unwanted behaviors, aggressive or annoying. However, a behavior that is suppressed is a behavior that is still unaddressed. By suppressing unwanted behaviors the underlying cause is left untreated and when the punisher is removed from the equation the behavior will most likely resurface or may eventually escalate. Additionally, when using punishment in training you also risk forming negative associations with other aspects of your dog’s life. These bad associations could form with: other dogs, other people, strangers, new situations, loud noises, and even yourself! Click here to read why you shouldn’t punish a growling dog, just one of the many examples of an unwanted behavior. Using positive reinforcement methods you CAN achieve quick and reliable results without the potential of negative side effects. Not into the ewwey gooey stuff? That’s okay, neither am I, well not always ;-). I choose my methods because they work. My job is to help you develop a personalized plan that will work for you without causing more problems. 5) Do you guarantee results with your training? There are a few popular franchises that will guarantee results with your dog. However, dogs are all individual sentient beings and their behavior is constantly changing. There is no possible way that I would be able to predict with 100% certainty (guarantee) that your dog would always do what you wanted once trained. Not only that but there are always other factors, beyond my control, that will effect what your dog learns. Therefore, I do not offer a guarantee by any means and would not trust any trainer who does as I believe they are being severely unrealistic and untruthful. What I can promise to you, is that I will give you honest, safe, and scientifically proven advice even if it is not what you want to hear.